Citation Information: J Clin Invest. 2006;116(1):125-136. https://doi.org/10.1172/JCI26040. Using an siRNA-based screen, we identified the transcriptional corepressor RIP140 as a negative regulator of insulin-responsive hexose uptake and oxidative metabolism in 3T3-L1 adipocytes. Affymetrix GeneChip profiling revealed that RIP140 depletion upregulates the expression of clusters of genes in the pathways of glucose uptake, glycolysis, TCA cycle, fatty acid oxidation, mitochondrial biogenesis, and oxidative phosphorylation in these cells. 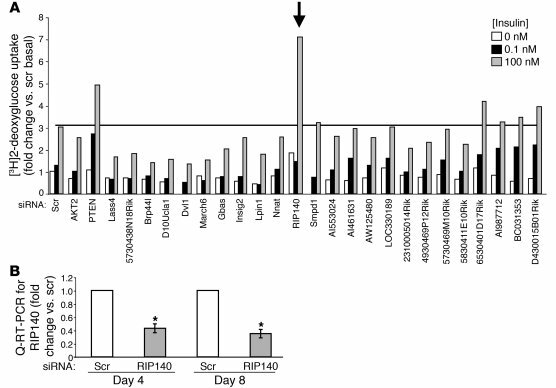 Conversely, we show that reexpression of RIP140 in mouse embryonic fibroblasts derived from RIP140-null mice downregulates expression of many of these same genes. Consistent with these microarray data, RIP140 gene silencing in cultured adipocytes increased both conversion of [14C]glucose to CO2 and mitochondrial oxygen consumption. RIP140-null mice, previously reported to resist weight gain on a high-fat diet, are shown here to display enhanced glucose tolerance and enhanced responsiveness to insulin compared with matched wild-type mice upon high-fat feeding. Mechanistically, RIP140 was found to require the nuclear receptor ERRα to regulate hexose uptake and mitochondrial proteins SDHB and CoxVb, although it likely acts through other nuclear receptors as well. We conclude that RIP140 is a major suppressor of adipocyte oxidative metabolism and mitochondrial biogenesis, as well as a negative regulator of whole-body glucose tolerance and energy expenditure in mice. An siRNA-mediated screen identifies Nrip1 (RIP140) as a negative regulator of deoxyglucose uptake in 3T3-L1 adipocytes. (A) Four days after the induction of differentiation, 3T3-L1 adipocytes were transfected with smart pools of siRNA against a panel of genes (GenBank accession numbers are provided in Supplemental Table 1) selected as highly expressed in muscle and 3T3-L1 adipocytes compared with 3T3-L1 fibroblasts. The effect of each knockdown on glucose uptake was determined using a 2-deoxyglucose uptake assay. Arrow indicates insulin-stimulated 2-deoxyglucose uptake in RIP140-knockdown cells. Shown is the average of 2 independent experiments. (B) siRNA-mediated depletion of RIP140 mRNA was confirmed by real-time RT-PCR. The graph represents the mean ± SEM of 3 independent experiments. Scr, scrambled; Q-RT-PCR, quantitative RT-PCR. *P < 0.05 compared with scrambled.